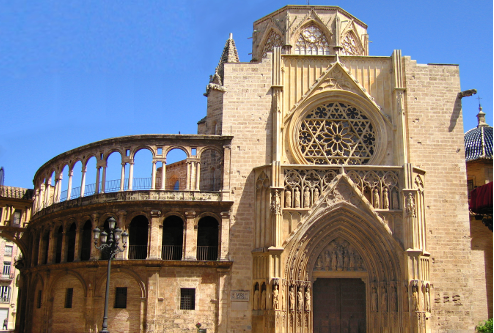 Valencia Cathedral is the religious center of the city. It is also the seat headquarter of the Archbishop of Valencia. 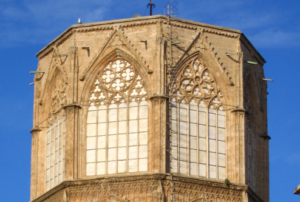 Located in the center of Valencia, in Plaza de la Reina, combining a range of architectural styles and founded in the 13th century, Valencia Cathedral is the religious center of the city. It is also the seat headquarter of the Archbishop of Valencia. Built on the site of the main mosque (mezquita de Balansiya) right after the Re-Conquista, the Cathedral combines in a spectacular way styles such as Gothic which is predominant, Baroque and Neo Classical. El Miguelete, the impressive tower of the cathedral (Gothic Valencian sculpture) is one of the most visited monuments of the city. It has 207 steps that can be climbed and it offers spectacular views over the entire town, being the highest religious structure in Valencia. 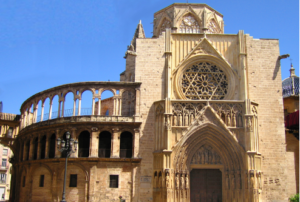 The Cathedral incorporates an interesting collection of paintings (two by Goya), religious and artistic treasures, also more and more researchers conclude that the authentic cup used by Jesus in the Last Supper, the famous Holy Grail, is the one exhibited in the Cathedral of Valencia.